The world is a nasty place, isn't it? Full of criminals, liars and thieves. Even today, in the 21st century we see an abundance of violence, hatred, and prejudice. But we're different, aren't we? We are martial artists, these things should not exist within the dojang, right? "...we are always called to be teachers of Right Conduct..."
We are charged via our practice of the martial arts to ALSO practice our martial virtues. In Dang (Tang) Soo Do we all memorize the 10 Articles of Faith, and for the most part they are pretty self explanatory. But there is one that might not be so straight forward. You should know this one as "Be Faithful Between Teacher and Student". In the Tangsoodo Kyobon, Hwang Kee expands on this with... 의정(義情)으로 진리(眞理)를 배움. Which in a nutshell says... "Learn the Truth (眞理 - "Truth") following correct Teacher-Student Protocol (義情 - "Righteous Information")." So... "Righteousness" 義? To be righteous in learning is incredibly important as a martial arts student. And it's something we must never forget, even as we become teachers ourselves. Because we are always called to be teachers of Right Conduct. And it is this Righteous student/teacher code that Hwang Kee really wanted to stress with this article of faith. It is really the basis for the "Faithful" part. 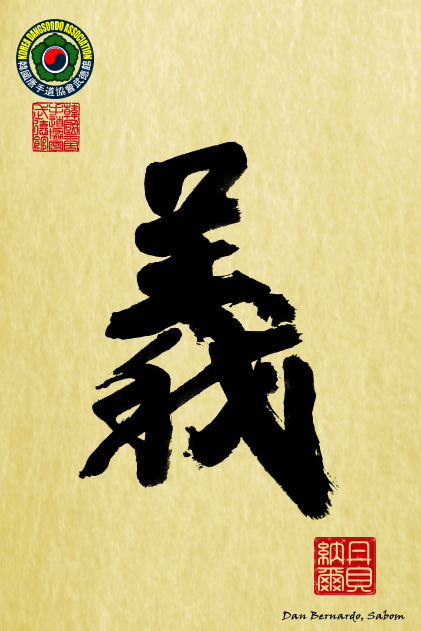 He uses the Hanja 義理 which means Duty, Loyalty, Honor and Gratitude. Never forget that a real Sabom is the example and this faithful relationship is a two-way street. If we are loyal to our students, they will be loyal to us. The world is a crazy place, with so much violence. But if we live our lives with the virtues that our martial art's path has set out for us, not only can can we be a "Righteous" guide for our students, but a shining light to the world. It may seem odd that a martial arts school would be the place where that craziness and violence doesn't exist. But we at the KDA believe that the dojang is the place where all of the nastiness should get washed away. Flooded away by all of the blood, sweat and tears from true hard work. Training puts us all on an even field. And through our suffering we are raised up to gentle-men and women.